Journal of Nanjing Agricultural University, 2019, 42(2): 284-291. 张晨智, 张旭, 陈抒瑶, 等. 健康与发病香蕉植株内生细菌菌群差异[J]. 南京农业大学学报, 2019, 42(2): 284-291. Abstract: [Objectives] Fusarium wilt of banana is devastating banana plantations worldwide. In order to provide reference for biocontrol bacteria isolation and disease control, the endophytic bacterial communities in different parts of healthy and diseased banana(Musa AAA cavendish cv. Brazil) plants were studied. [Methods] The endophytic bacterial communities in different parts of healthy and diseased banana plants were profiled through MiSeq high-throughput sequencing of the bacterial 16S rRNA amplicons. [Results] The endophytic bacterial community Shannon diversity and Chao1 richness index in roots of healthy banana plants were 6.11 and 671, followed by leaves which were 5.49 and 370, and stems which were 2.50 and 237. The Shannon diversity and Chao1 richness index in root of diseased banana plants were 6.86 and 1 226, followed by stems which were 5.08 and 731, which were higher than those of healthy banana plants though the difference of Shannon diversity of root was insignificant. The endophytic bacterial community patterns were significantly different between the healthy and diseased banana plants. Delftia, Bacillus, Salinispora, Asticcacaulis and Zoogloea were indicator genera in healthy banana plants which were not detected in the diseased banana plants after buds. [Conclusions] The banana plants selectively absorb microbiome from the environment that different parts of banana plants had different endophytic community. The endophytic bacterial community composition and the diversity of banana plants were closely related to their health levels. The invasion of pathogen reduced the prevention level of banana plants to the microbial community outside of the plants. 图 1 健康与发病香蕉不同部位内生细菌菌群多样性分析 Fig. 1 Analysis of endophytic bacterial community diversity between different parts of healthy and diseased banana RD:发病香蕉植株根部; RH:健康香蕉植株根部; SD:发病香蕉植株茎部; SH:健康香蕉植株茎部; LD:发病香蕉植株叶部; LH:健康香蕉植株叶部。不同字母表示处理间在0.05水平差异显著。下同。 RD:Diseased banana plant root; RH:Healthy banana plant root; SD:Diseased banana plant stem; SH:Healthy banana plant stem; LD:Diseased banana plant leaf; LH:Healthy banana plant leaf. 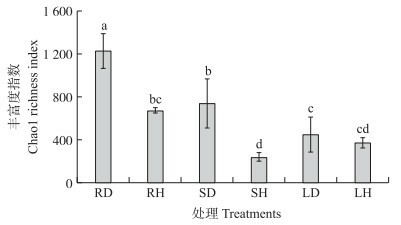 Different letters indicate significant differences in different treatment at 0.05 level. The same as follows. 图 4 健康与发病香蕉植株各部位内生细菌群落组成的多元回归树 Fig. 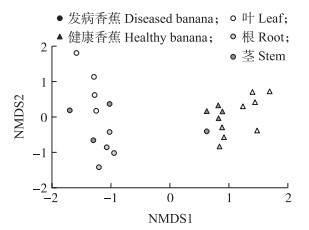 4 Multivariate regresson tree(MRT)of endophytic bacterial community in various parts of healthy and diseased banana 回归树中分叉点上的数字表示被解释的方差比例。Numbers under the crosses of each split indicate percentage of variance explained by the split. 图 5 健康与发病香蕉植株根部OTU(A)及共有OTU属(B)水平分析 Fig. 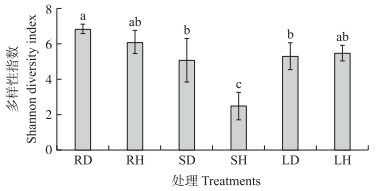 5 Analysis of OTU(A)and common OTU genus(B)between healthy and diseased banana plant root 图 5-A中数值代表OTU数目, 百分比代表这些OTU所包含的序列数占各样品总序列数的比例。下同。 The numbers in Fig. 5-A represent the OTU number. The percentages represent the proportion of the reads of these OTU in each sample. The same as follows. 邱优辉, 李会, 徐贞贞, 等. 我国香蕉产业现状与发展的科技措施[J]. 农业现代化研究, 2011, 32(2): 200-203. 赵娜, 李荣, 辛侃, 等. 茄科蔬菜轮作对高发枯萎病蕉园土壤可培养微生物的影响[J]. 热带作物学报, 2014, 35(8): 1469-1474. 朱小花, 赵利敏, 戴晓灵, 等. 香蕉枯萎病生物综合防控技术研究[J]. 广东农业科学, 2013, 40(7): 86-88. 陈龙, 梁子宁, 朱华. 植物内生菌研究进展[J]. 生物技术通报, 2015, 31(8): 30-34. Chen L, Liang Z N, Zhu H. Research advances in the studies of plant entophytic[J]. Biotechnology Bulletin, 2015, 31(8): 30-34 (in Chinese with English abstract). 陈博, 朱军, 孙前光, 等. 一株抗香蕉枯萎病内生细菌的分离鉴定及其抗病促生作用[J]. 微生物学通报, 2011, 38(2): 199-205. Chen B, Zhu J, Sun Q G, et al. A bacterial endophyte from banana:its isolation, identification, activity to Fusarium wilt and PGPR effect to banana seedlings[J]. Microbiology China, 2011, 38(2): 199-205 (in Chinese with English abstract). Wang M Y. Diversity research of endophytes and broad-spectrum antagonistic bacterium screening from banana[D]. Haikou: Hainan University, 2014(in Chinese with English abstract). De'Ath G. Multivariate regression trees:a new technique for modeling species-environment relationships[J]. Ecology, 2002, 83(4): 1105-1117. Anderson M J. A new method for non-parametric multivariate analysis of variance[J]. Austral Ecology, 2001, 26(1): 32-46. Zhang M M. Apreliminary study on the isolation and identification of endophytic bacteria in white fragrant and distribution[D]. Guangzhou: Guangzhou University of Chinese Medicine, 2017(in Chinese with English abstract). 付业勤, 蔡吉苗, 刘先宝, 等. 香蕉内生细菌分离、活性评价及数量分布[J]. 热带作物学报, 2007, 28(4): 78-83. 蓝江林, 刘波, 焦会民, 等. 香蕉植株内生细菌群落多态性研究[J]. 热带亚热带植物学报, 2012, 20(3): 285-291. 李文英, 彭智平, 于俊红, 等. 香蕉根际促生菌的研究展望[J]. 热带作物学报, 2011, 32(1): 182-187. Meng X F. Analysis on diazotrophic communities in the rhizosphere of beach plant Jerusalem artichoke and the mechanism of action of its endophytic bacteria[D]. Nanjing: Nanjing Agricultural University, 2015(in Chinese with English abstract). Li F Q. Isolation and screening of marine actinomycetes and study on the function of its two-component signal transduction system[D]. Jinan: Shandong University, 2015(in Chinese with English abstract). 李静, 操一凡, 丁佳兴, 等. 含复合菌群生物育苗基质的研制及其育苗效果[J]. 南京农业大学学报, 2018, 41(4): 676-684. Peng A Q. Cloning and functional confirmation of the tetR related to antagonistic activity to Delftia tsuruhatensis MTQ3[D]. Tai ' an: Shandong Agricultural University, 2012(in Chinese with English abstract). Hao X J. Study on antagonistic bacteria for biocontrol of the Fusarium wilt[D]. Hangzhou: Zhejiang University, 2006(in Chinese with English abstract).